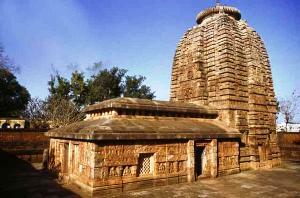 Parsurameswar Temple built in around 650 A.D., the Parsurameswar Temple is also one of the older temples of Odisha. It is also one of the best preserved monuments and almost all of the sculptures in the temples are in good conditions. A typical example of the Kalingan style of temple architecture, the temple features pine spire curving up to a point over the sanctum and the pyramid-covered Jagamohana, where people sit and pray. The decorative scheme of the shrine, in the temple, is well-organized, with close adherence to ancient architectural texts. This is apparent in the base molding, the clear-cut division of the wall into three segments, and the very precise decorative treatment of the shrine tower. The shrine of the presiding deity, Lord Shiva is richly decorated. The walls and outer sanctum has sculptures of amorous couples, animals and floral designs. The windows of the temple have exquisite bas-relief of horses and elephant processions and lattice work. The outer wall of the temple has carvings of Lord Ganesh, Kartikeya, Shiva, Parvati, and other deities. There are also several carvings depicting stories from Puranas. The architrave of the inner doorway is decorated with figures of the eight planets. The carvings of the shrine are vastly superior to those of the hall. In the northwest corner of the temple compound is the exotically unique ‘one thousand Lingas’.